Janice James bred and raised what is undoubtedly the most decorated Dominique ever. 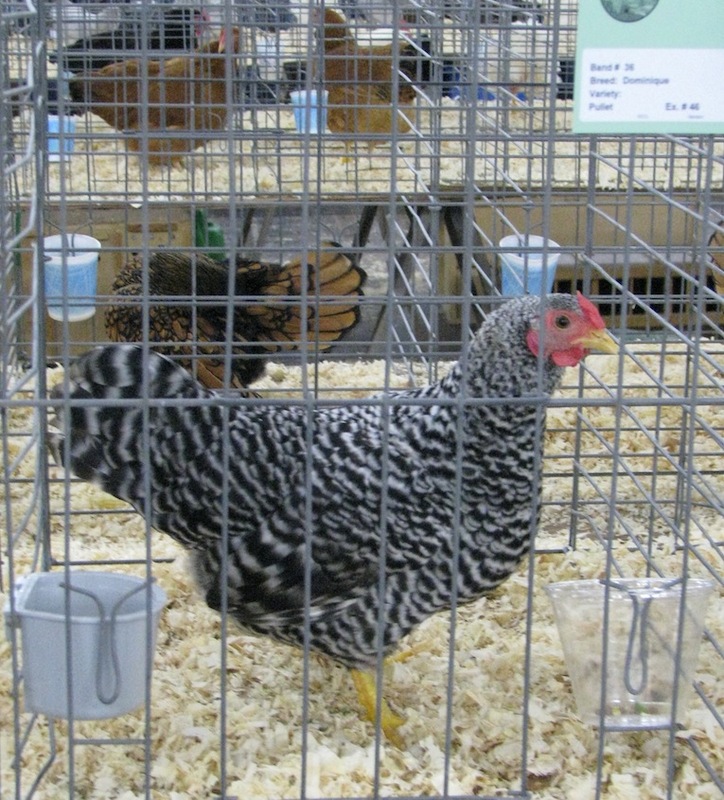 The only two that might surpass her fame would be the A. Q. Carter cockerel and the pullet, Speckle who became the subjects of the Schilling prints, but even they did not win at the shows like Janice’s bantam #33. 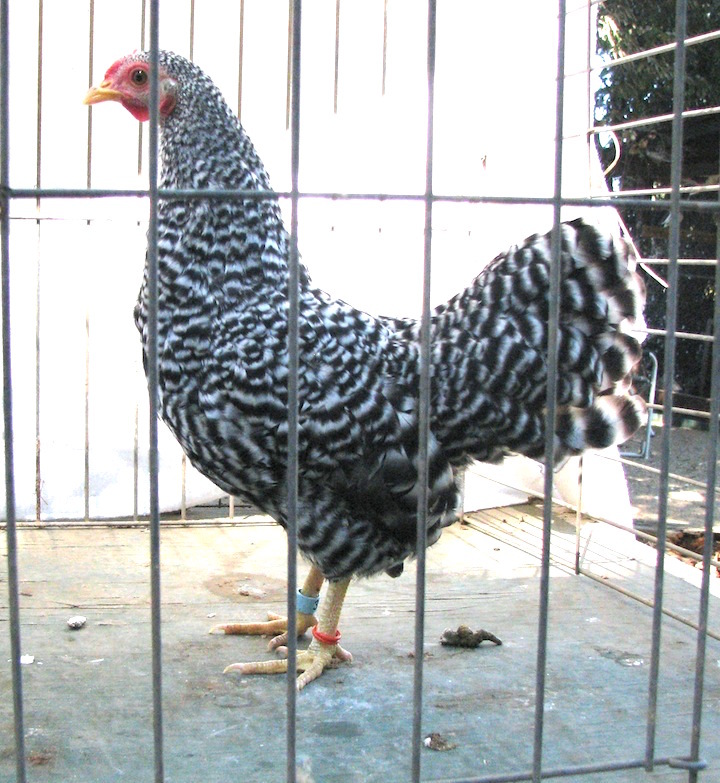 When I started trying to raise and show Dominique bantams in 2001, the only place I could find them was Cackle Hatchery. I kept a few as pets over the years, but when I decided I wanted to show the breed in about 2009, people suggested contacting Fred Farthing. Fred was kind enough to sell me a trio. From that trio, and the few Cackle birds I had left, I raised a few chicks and worked with them. In 2012 I got two pullets that ended up being my foundation birds, #31 and #35. I showed both of them, but they and their brothers were too big. The females were about 35 oz and the males were at least 40 oz. 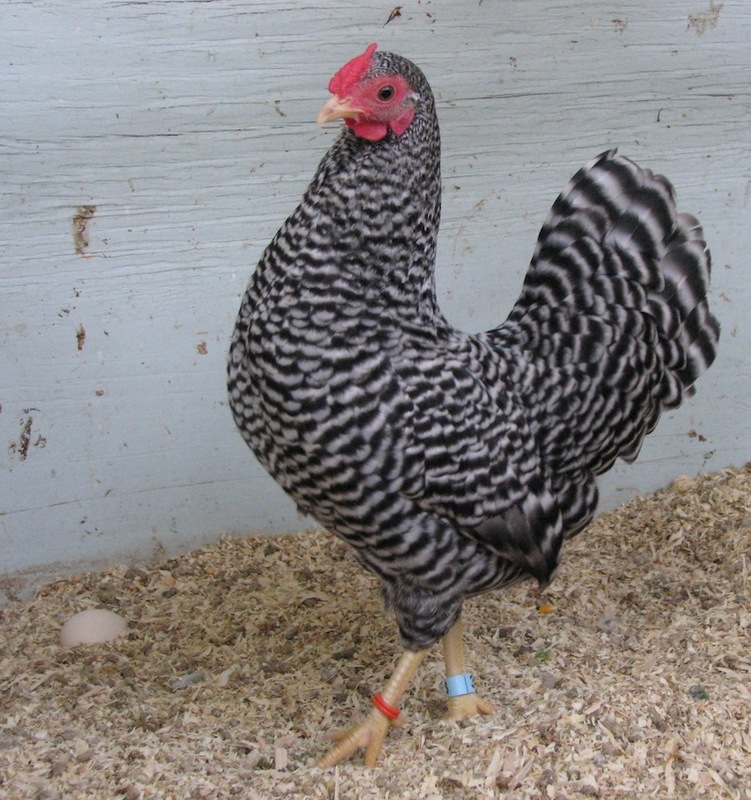 Just as the breeding season started in 2013, I was given a trio of Dominique bantams by Kyle Tripp. Kyle said they were from Wally Casazza’s line. These birds were much smaller than the birds I was raising, though the male, #27, was a very solid 31 oz. I crossed him with several of my females. I got a pretty wild assortment of chicks, some were smaller but some were even bigger than what I’d been getting. The improvements they had in common were great tails and a more upright stance. A pullet from this cross that was hatched on May 6, 2013 caught my eye from the beginning. At 13 weeks, she was 17 oz. My notes on her card are: “Very small, great color.” She had clear yellow legs and just a faint tinge on her beak, with a small, delicate comb and fine bones. At 7 months old she weighed 26 oz. A little over the Standard, but a LOT smaller than anything I’d ever raised. #33’s first show was at Paso Robles when she was 6 months old. She was RB. She grew and improved. The next show, she was BB. And the one after that, Bakersfield in November, she was Best of Show. That was the biggest thrill of my life. This little hen was born to show. As I write this, in February of 2018, she has just been to her 33rd show. She stays in great show condition, she travels well, and seems to like being at shows. She’s not been sick a day in her life. Her second Best of Show she was 4 years old. In her younger years, she was graceful and showy. 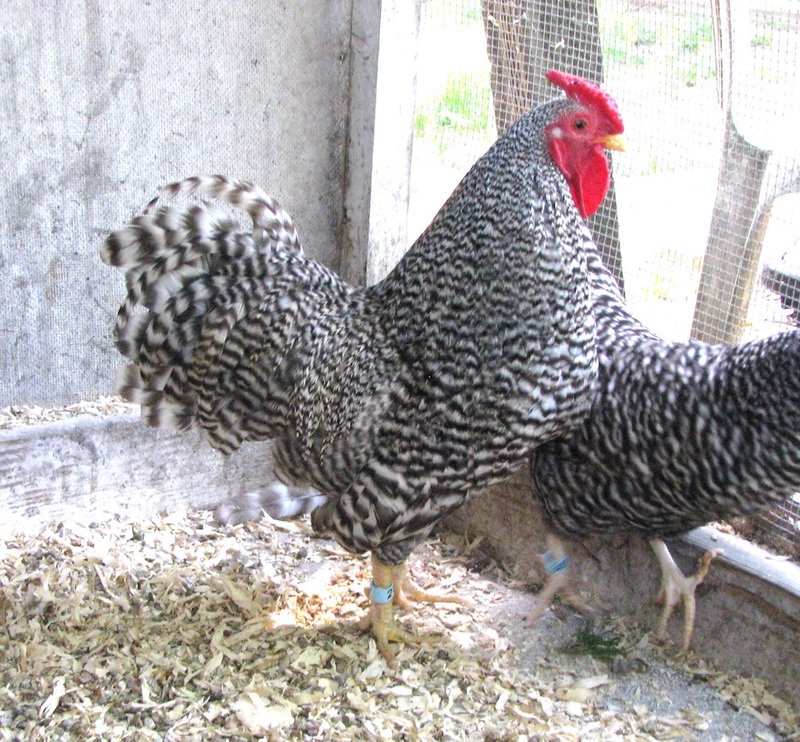 She has grown into a well muscled hen. These are her winnings, through Feb. 2018. Eighteen different judges have evaluated her. The table shows her accumulated winnings. 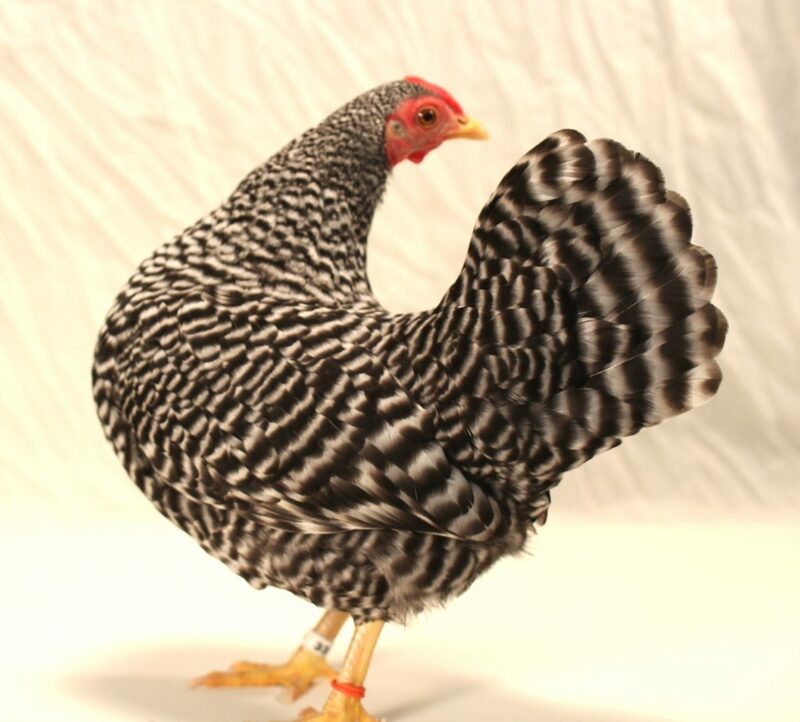 For example, in winning Best of Show, she also won BB, Best RCCL, and Best Bantam. 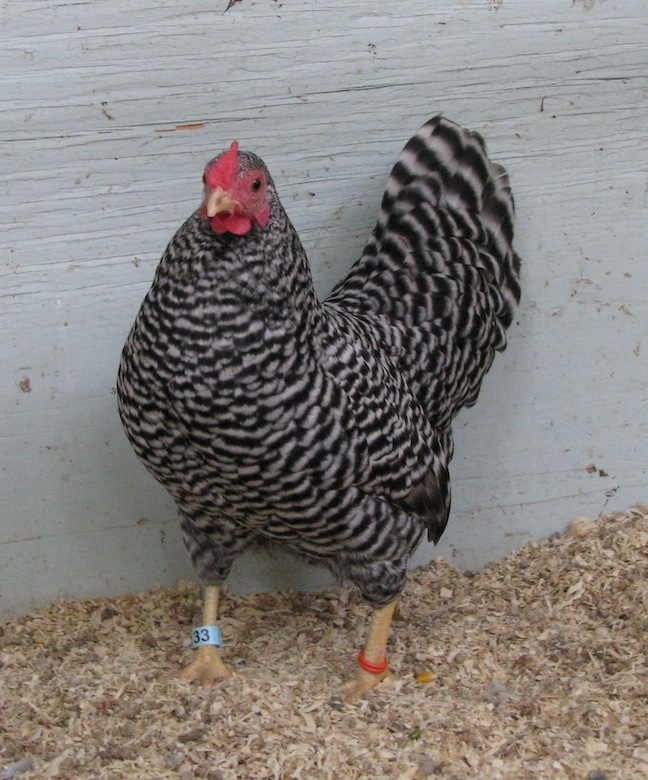 This hen’s major fault is that she isn’t a prolific layer. Her mother is (she’s 6 years old now) and her daughters are, but #33 has a short, quick laying season. Two of her daughters have been good show birds. One of her sons is the father of most of the females I show.